Puppies often take time to adjust. Those first few nights of listening to them cry their little hearts out because they miss Mom and the gang seems like torture to us. I am sure it feels like torture to them also, but they quickly begin to adjust and look to us for love and kindness. I would guess that somewhere in their hearts there is always a fond remembrance of Mom, but they seem to adapt to new situations quickly in most cases. Enjoy them as puppies because they grow up all too fast to become dogs. Sometimes during the puppy stage when we are on our hands and knees cleaning up puddles, we wish they would grow up, but it does happen all to quickly. Enjoy the puppy breath while you can. I have been fortunate enough to have many puppies during my lifetime. My heart always breaks the first few nights when they cry and miss Mom. I have tried all the tricks from the ticking clock in their crate, the hot water bottle, stuffed toys, etc. I have even put the crate up on my bed next to me to try to help console the poor little critter. But most puppies just take time to adjust. I have seldom let one sleep on my bed when they were very small. Mostly because I was always afraid of rolling over on them when I was asleep. I do allow several of my adult dogs to sleep on my bed as long as they stay in their own space and not infringe on mine. Occasionally I will have the smallest cuddled next to me on a very cold morning. Sometimes I think - where�s my Mom, where�s my Dad? Trying to remember the past. But then I remember the kind gentle hearts of a family that walk on two legs. Those special treats from the cardboard box - a delight from kind human hands. I�m surrounded by love, treated with kindness - even have my own bed. 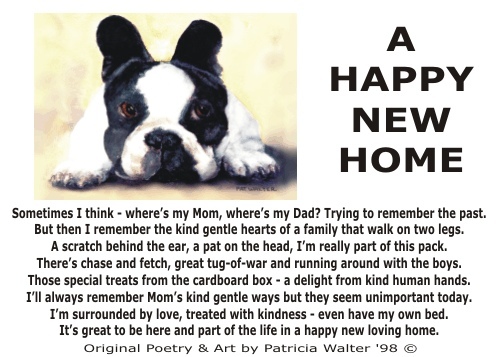 It�s great to be here and part of the life in a happy new loving home.